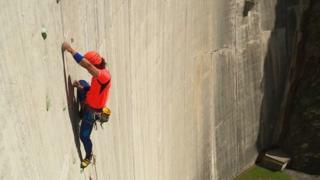 If abseiling down the Wales Millennium Centre does not shatter your nerves then why not attempt to climb a 540ft wall? CBBC's Radzi Chinyanganya did both in his challenge to climb the highest man-made climbing wall in the world - the Diga di Luzzone in Blenio. Find out how he managed to reach the top. Do you want to get into climbing? Visit our Get Inspired climbing page for information on how to get involved.